I just mailed off this double-sided painting on very thin abaca I made in New jersey. This piece is a reenvisioning of a painting I did for The Making last year. I am very honored to be among many of my heroes participating in the first Art Benefit for the Lesbian Herstory Archives. more info and to buy raffle tickets here. A few early works of mine reappeared after going missing 5 years ago. I decided to celebrate by placing them in the AS220 Flatfile progam. WHAT DO WE HAVE TO FEAR NOW? And to whoever was responsible for getting them back to me, thank you. I am very proud to say that the entire class took up the collaborative repeat challenge. Thank you to Cate, Rou, Jim and Elaine for your hard work and your willingness to work as a team. GO TEAM. I am teaching another class Intro to Printmaking 4 sessions starting November 1st. More info at the end of this post. This intensive workshop is designed as an introduction to or refresher of the basics of printmaking techniques. Intaglio, Screenprinting, Letterpress, Relief and Photopolymer plate making will be covered. This course will offer samples of all the disciplines supported by the AS220 Printshop and is perfect for those interested in printmaking, but unsure about where to begin. Participants should come prepared to work with images they want to translate a multitude of methods. I made this simple repeat on two kinds of blue cloth as a sample for a textile printing class I am teaching at the AS220 printshop starting next Wednesday. 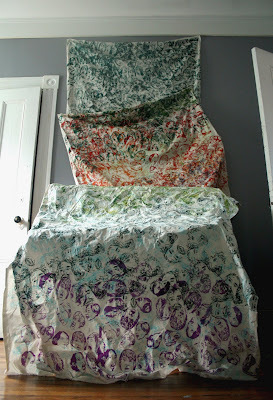 I think most people will be interested in Screenprinting, but I thought I would explore block printing on cloth. The matrix is a small piece of linoleum. It is printed in oil based ink. We will see how it washes. There is one spot left if you'd like to sign up Click this LINK.